Even in the city, you’re not far from the jungle. For our last hurrah in South America, Christine and I found ourselves in Iquitos, Peru, the largest city in the world that is inaccessible by car. Once again, proving that the backpacking circuit is much smaller than one would expect, we found ourselves on the same flight as our Dutch friends from the Bolivian salt flat tour. Robert and Ninka had more or less the same plan as us: fly into Iquitos, go on a jungle tour, and then take the public ferry five days upriver to Pulcullpa. We agreed to share a taxi with the Dutch couple, and upon leaving the airport we were immediately inundated with drivers. We somehow bid one driver down to the astronomically low rate of 2 soles (less than $1), for the 6 km drive into town. When riding around Iquitos, a city of 400,000 people, I was struck by one question alone, “How did all of this stuff get here?” Iquitos would never be considered cosmopolitan, but it did seem to be a vibrant metropolis in the middle of the jungle, with everything one could reasonable hope for. The city had a laid-back vibe, and we noticed the Peruvians here seemed to move at a different pace from the more Incan-minded ones in the south. We enjoyed its restaurants overlooking the banks of the mighty Amazon, and the promise of exotic adventures just over the horizon. Also, the hot weather, third world feel, and readily available tuk-tuks gave the city a familiar sensation of being back in India, a place obviously near and dear to our hearts. Under different circumstances, we may have decided to stay in Iquitos for longer, but our final flight out of South America was looming large. We had come here to see the jungle, and we were determined to do just that. After a bit of shopping around, we walked into a perfect situation: a tour with eight other foreigners that was leaving the next day. We were lucky because a group of five Spanish-speaking Belgian girls had already negotiated the price of the trip down substantially. The tour guide, Alex, told us with a laugh that he couldn’t charge us more, because we would certainly talk to these girls on the tour, and then he’d have a problem when we returned. The three day trip would be to a lodge approximately 4 hours upriver by car and motorized canoe. We were split into two groups: the aforementioned Belgians in one group, and our group, which included a Spaniard, and a British couple. We were lead by a local who went by the name Larry (though I would be willing to bet it was not his real name). Incidentally, the Brits were there to partake in the Ayahuasca ritual, a shamanic tradition wherein one imbibes a hallucinogenic drink, vomits and shits everywhere, and then, and I believe this is the medical term, “trips balls.” The couple tried to play it up as a spiritual experience, but I strongly suspect that they really just wanted to get high. Of the three days, the first was decidedly the best. 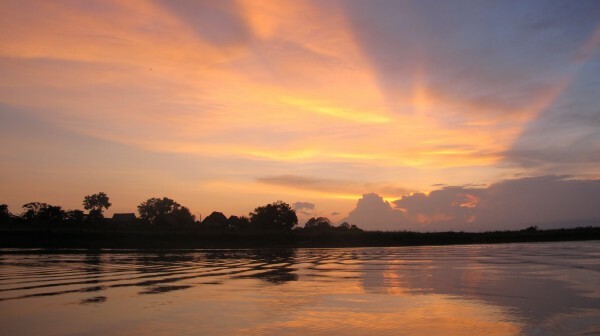 Our lodge was located on the shores of one of the countless tributaries that fed the Amazon. When our boat made the turn up this side channel, the water turned from a light, muddy brown, to the color of dark chocolate. As soon as we reached the lodge, we were told to put our stuff down, grab our mosquito spray, put on some rubber boots, and follow our guide into the thick of the jungle. Before we even left the lodge clearing, we saw a pigmy marmoset hiding on the trunk of a nearby tree. The foliage soon became thick and Larry began hacking his way through recent growth with his machete. In a matter of just a few feet, the lodge was obscured by the abundance of greenery. 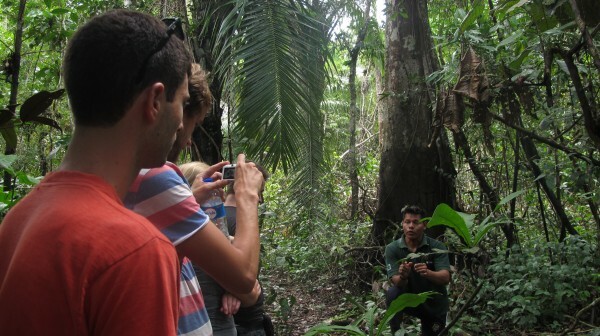 Once in the jungle, we heard more than we saw, though the trained eye of our guide helped us fill in some of the gaps. He also made sure to point out many of the dangers along the way. When I think of the dangers of the Amazon rain forest, I think of snakes, scorpions, and diseases, but we came into contact with none of those things (thankfully). Instead, we were shown various plants to stay away from–yes, even the plants in the Amazon were dangerous. 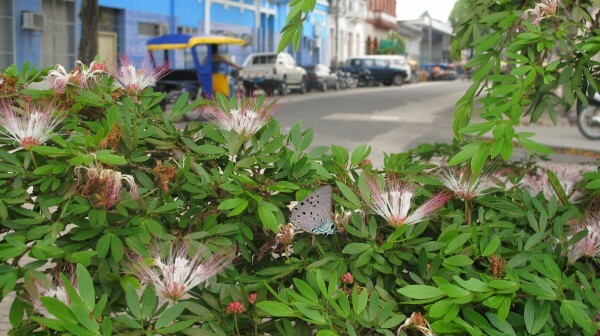 Many had razor-sharp spikes; I would gain an intimate knowledge of one of these spiny trees when I tripped on an early morning expedition on the second day and brushed my elbow against it. The tips of these spikes broke off under my skin, and were impossible to remove, even with tweezers. Another type of tree, was populated by a thick layer of tiny, poisonous ants. One brush against the tree would result in perhaps hundreds of bites. At first glance, I could not detect any ants, so our guide reached up with his machete and carefully peeled off a few dozen tiny ants to show us. I was officially terrified. Larry spotted one more surprise before we ended this first trek into the jungle. He pointed to a spot on a wide tree root, and we still didn’t see. We leaned in closer, and finally we saw what he was pointing out, a tarantula nest. It had spun a web that acted as a cover, and it blended in almost perfectly with its surroundings. Larry improvised quickly, using a stick and another bug as bait to try to draw the tarantula out from hiding. Within a few seconds, the long, hairy legs of this famous arachnid took a few tentative steps out. It did not, however, grab the helpless insect, and instead decided to return to its den. He was clearly not impressed with this ruse. After lunch, we headed back out onto the Amazon proper, for what was, in my opinion, one of the highlights of not just the jungle tour, but our entire South American trip. We were told that we were looking for dolphins, and boy did we get them! Larry, sitting confidently at the front of our wooden, leaky canoe, told us to look out for birds circling, because this is where we will find the dolphins. He explained that they liked to hunt together, joking, “The birds are the air force, and the dolphins are the marines.” It wasn’t long before we saw some commotion on the surface of the river upstream. I took out my binoculars, and sure enough, there were dolphins splashing around. As we got closer, binoculars were no longer needed. These were not the more famous pink river dolphins, but instead smaller grey ones. They were difficult to watch and nearly impossible to capture on camera. They would make a spectacular jump to our right, disappear for thirty seconds, surface to our left, disappear for a few minutes and then appear directly behind us. This went on for quite some time. Suddenly, in the distance, a bright, bright pink fin broke the water. The pinkness of this larger, slower dolphin cannot be exaggerated. I would love to post a picture we took of one, but they proved to be just as elusive as their smaller cousins. I could have watched the dolphins for hours, but we had to get moving. 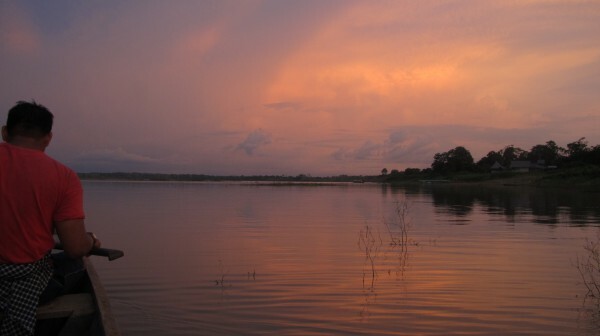 As we returned to lodge, we were treated to one of the most beautiful sunsets I have ever seen. The storm clouds that surrounded us created a panorama of pinks, reds, oranges, and purples. The colors were so vibrant, it was difficult to determine where the sun was actually setting. From time to time distant lighting strikes would add further illumination to the already magnificent setting. The storm eventually caught up with us after dinner, this was the rainforest after all, and we went to sleep inside our mosquito nets, listening to the rainfall and wildlife. The morning started out with a rather unfruitful attempt to see exotic birds, and an even more unfruitful attempt to fish in the Amazon. Well, it was unfruitful for me, everyone else did just fine. My girlfriend in particular seemed to have no problem hauling in large fish after large fish. Single-handedly, she caught lunch for us and most of the surrounding locals. The Brits had a few respectable catches, and the Spaniard had a particular penchant for catching catfish. Meanwhile, instead of catching fish, I was feeding them. I would feel a slight tug, try to haul the fish in, only to find my bait gone, and an embarrassingly empty hook. Christine’s catch. He was surprisingly tasty. 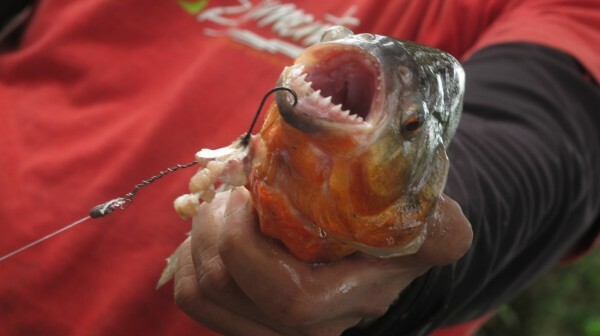 Christine had the largest catch of the session, a terrifying red-bellied piranha. How terrifying are these things? It had been out of the water for a solid half an hour when we placed another fish next to it. It bit through this other fish. If I’m drowning, I think eating would be pretty far from the forefront of my mind. Later in the afternoon, after eating my girlfriend’s catch for lunch, we set out on the canoe again, up the tributary to where we would be spending the night camping. When we were being told about the tour, this seemed like a much better idea than it wound up being. The campsite consisted of hammocks strung from trees, each one surrounded by its own mosquito net. When the sun set, the mosquitoes came out in dizzying and terrifying force. The insect repellant seemed to have little to no effect, and the constant buzzing around the ears quickly became maddening. Yes, that spider is as big as our guide’s hand. After sunset, we headed back out on the river for nightmare of a boat ride. 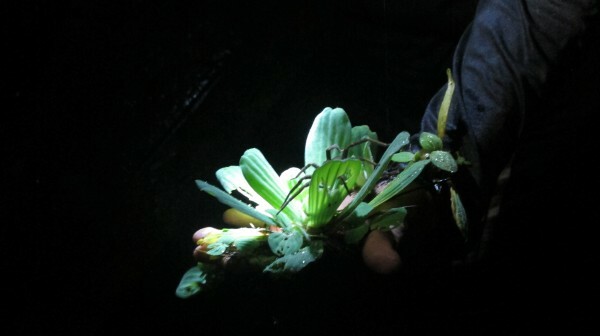 For one, we kept getting stuck in large patches of plants that grew on the surface of the river. This would have been fine, had it not been for the massive amounts of insects, arachnids and other creepy crawlies that decided to join us in the boat. Did I scream like a girl? Yes, I did. Our guides were dead set on finding a caiman, a type of alligator, and would not give up the hunt. After a great deal of time, they dropped us off on the shore, left us at night, in the middle of the rainforest, in the rain, and proceeded to spend another half an hour trying to find one. They eventually gave up, and another frightening boat ride awaited us to make our way back to the campsite. None of us slept very well in our hammock cocoons. We were cold, wet, and the jungle noises at night can be overwhelming. Most of us were quiet on the way back to the main lodge. Suddenly, the most amazing thing happened: a fish jumped out of the river, hit me and started flopping around at my feet, inside the boat. When even the world’s worst fisherman can catch a fish without trying, you know you’re in an interesting and fantastic place. We headed back to Iquitos early in the afternoon, tired, smelly, and covered in mosquito bites. We had done the jungle, and now wanted nothing more than a shower, happy to be back in civilization. Jokingly, I asked Christine if she was jealous of our Dutch friends who were braving the jungle for a full week. We both agreed that three days was perfect.